A three day workshop on PHP and JAVA was organized by the PG Dept. 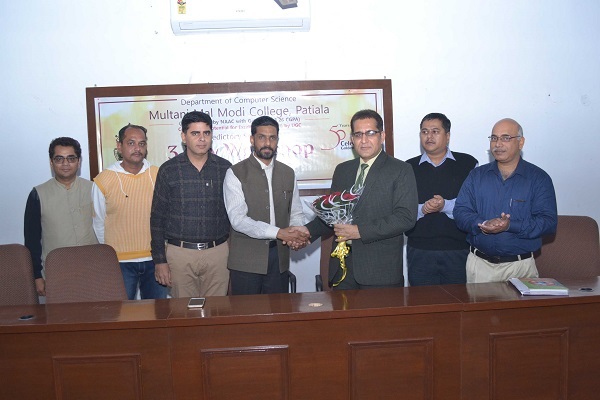 of Computer Science and Placement Cell of Multani Mal Modi College, Patiala. Experts from Solitaire Infosys Pvt. Ltd. Mohali conducted the workshop. During the three day workshop the participants learned the required skills and tools for web-development widely used in the industry. 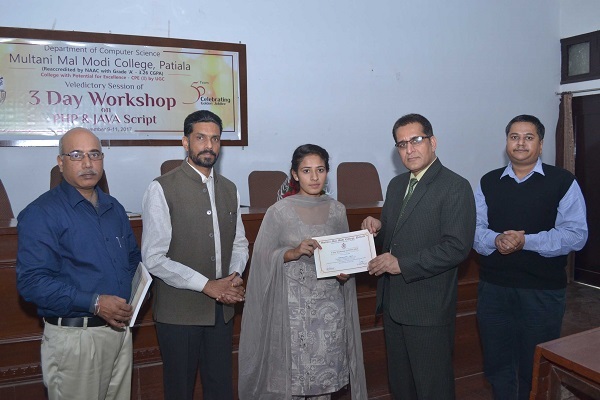 Dr. Rajesh Kumar, Professor, Thapar University, Patiala presided over the valedictory ceremony of the workshop. He told the students about the importance of hard work in today’s competitive world. He advised the students to build a habit of putting more hours on study to acquire employability skills. He motivated the students to learn about new technologies like machine learning, android apps development, drone technology, animation and gaming. 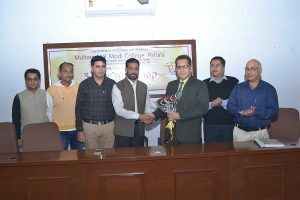 Dr. Khushvinder Kumar, Principal of the college welcomed the chief guest and said that such workshops are oragnised to enhance the skills of students. He emphasized the need of self supporting the education expenses to be more responsible towards the studies. He appreciated the efforts of the department for the conduct of the workshop and the keen interest shown by the students during 3 days. Prof. Vinay Garg explained the purpose of the workshop and importance of learning different technologies to be absorbed in the job market. Prof. Harmohan Sharma conducted the stage. Manpreet Singh and Priyanka, students of MSc (IT) given their feedback about the workshop. Dr. Ajit Kumar presented the vote of thanks. Dr. Ganesh Sethi put their special efforts to make the workshop success. Dr. Sumeet Kumar, Dr. Rohit Sachdeva and other faculty members were present in the workshop.